The Daily News Record's take on our local housing market . . . .
HARRISONBURG - The looming expiration of a federal tax credit for first-time homebuyers in November is being credited for a doubling of Harrisonburg and Rockingham County home sales when compared to November 2008. But while the news was good for those looking to sell before the original Nov. 30 deadline for buyers to qualify for an $8,000 tax credit, December was a return to more typical winter sales. In the city and county, home sales increased from 42 in November 2008 to 83 in November 2009, according to the Virginia Association of Realtors. But the numbers dropped into the mid-60s for December. The association also is crediting the buying incentive for boosting sales by 5.4 percent for the year in the Shenandoah Valley in 2009. The Valley reporting region comprises Frederick, Clarke, Warren, Page, Shenandoah and Rockingham counties and the cities of Winchester and Harrisonburg. The tax credit, which Congress has since extended, led to November being the third-highest sales month of 2009 for Harrisonburg and Rockingham County, said Scott Rogers, associate broker for Coldwell Banker Funkhouser Realtors of Harrisonburg. Typically, November is a slow month for home sales, Rogers said. Along with the tax credit, he said, some buyers have been encouraged about the overall home-buying climate because the amount of bad economic news has seemingly diminished. While the number of sales received a boost for November, the increase was not enough to change an overall decline in sales and median prices for the city and county in 2009, according to Rogers, who also operates the Web site HarrisonburgHousingtoday.com. Rogers' analysis of the city and county real estate market showed the sale of 561 single-family homes in 2009, which was a 14 percent decline when compared to 654 homes in 2008. The median sales price of a home declined from $215,000 in 2008 to $204,900, for a nearly 5 percent drop. The latest figures were significantly below 2004 and 2005, when the number of single-family homes sold hovered at 1,025 before dropping off to 909 in 2006, according to the Web site. The median sales price of a single-family home jumped from $170,000 in 2004 to $210,000 in 2005, for a 24 percent increase, according to the Web site. Many of the first-time homebuyers in November who took advantage of the federal tax credit bought relatively less expensive townhouses in Harrisonburg, Rogers said. Still, the overall sales and price of townhomes declined from 2008 to 2009, according to Rogers. 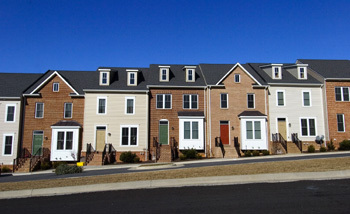 The 282 townhomes sold in 2008 dropped to 252 in 2009. The median sales price went down from $167,250 to $161,888 last year. The numbers contrast sharply with 2005, the peak sales year of the decade. That year, 644 townhomes were sold but the median price was $134,950. Statewide, fourth-quarter home sales for 2009 increased by 18 percent from 2008, according to an association statement Monday. "There's no question that [the number of] first-time homebuyers had a significant increase," said Lisa Noon, Virginia Association of Realtors vice president Lisa Noon. The tax credit deadline has been extended to the end of June, Rogers said. To qualify, a homebuyer must have a home under contract by the end of April and close by the end of June, he said. Nationally, the Commerce Department reported Wednesday that sales of new homes fell unexpectedly in December. According to The Associated Press, last month's results were the weakest since March and were only 4 percent above the bottom last January. Many in the industry, however, expect sales to pick up as the April 30 deadline for the federal tax credit nears. In conversation today about our local housing market, I was asked how in the world Harrisonburg and Rockingham County home values have stayed relatively level over the past few years when many parts of the state and country are not. One key reason for the relative stability in our housing market is continued LOW UNEMPLOYMENT. Thanks to Jim over at RealCentralVA, for pointing out the Washington Post's interactive unemployment map. To focus in on Harrisonburg and Rockingham County, here are a few snapshots from the Washington Post's interactive unemployment map. As seen above, all areas in Virginia and most in neighboring states experienced sub 7% unemployment rates in July 2007. As shown above, quite a few areas in neighboring states, and a few in Virginia started to see unemployment creep up to the 7% - 10% range in July 2008. OUCH! The vast majority of states surrounding Virginia were above 7% or above 10% or even above 13% in 2009. Most areas of Virginia outperformed these neighboring states --- and Haririsonburg and Rockingham County STILL experienced an unemployment rate below 7%. Power Search: Finding Cute Homes, Short Sales, Fixer Uppers and More! As you can see, this gave us 14 search results. Thus, if you've ever wanted to search for current short sale listings, you can do so using the Keywords field in my web site's Powersearch function. 22 listings are described as "cute"
28 listings are described as "cozy"
4 listings are described as "fixer upper"
Did you, or can you find a additional fun search term? Leave it in the comments, or e-mail me about it. What Percentage Of Under Contract Homes Actually Sell? This was an interesting question from one of my clients --- relative to whether we should take the time to go look at a property that is currently under contract. Their perspective was that if quite a few contracts fall through, it could be worthwhile to go look at an under contract property -- but if most stay together, then maybe not. As it turns out, most homes stay under contract if they go under contract. In 2009, 818 homes went under contract. Only 77 homes came back from being under contract. This contract success rate is a bit lower than past years, but much better than 2006! 2006: 998 homes went under contract, 120 contracts fell through --- an 88% success rate. 2007: 1,118 homes went under contract, 79 contracts fell through --- a 93% success rate. 2008: 882 homes went under contract, 70 contracts fell through --- a 92% success rate. 2009: 741 homes went under contract, 77 contracts fell through --- a 91% success rate. Looking For A Dutch Colonial In Rockingham County? Good Luck! There are only two listings on the market right now labeled as Dutch Colonial homes. Let's take a look at what IS for sale . . . .
As you can see, ranches, townhomes, contemporary homes and colonial homes are your best (or at least most prolific) option in Harrisonburg and Rockingham County. Also of note, here's what sold in 2009 . . . .
We find the same leaders -- ranches, townhomes, contemporary homes and colonials. Thus, we have a bit of a chicken/egg dilemma. Are these types of homes being sold because that's what people want, or because that's what is available. Here are the full numbers for those who are curious . . . .
Are Foreclosure Rates Increasing In Harrisonburg and Rockingham County? Over at HarrisonburgForeclosures.com, I post notices of upcoming Trustee Sales (foreclosure auctions). The graph below shows how many trustee sale notices we've seen over the past 7 months. As you can see, there has been a general increase over the past seven months, though it certainly could be a seasonal cycle since I don't have 12 months of data yet. Do remember that these numbers do not indicate how many properties are actually foreclosed on, but rather the number of properties for which a trustee sale is scheduled --- regardless of whether it ends up taking place. I'm working to get my hands on data about how many sales actually go through. Stay tuned! Starter Home Buyers Increase, High End Home Buyers Decrease . . . And Prices Remain Constant?? Jennifer Chapman, one of my associates at Coldwell Banker Funkhouser Realtors brought some very interesting data to light yesterday. She noticed that there are fewer and fewer homes selling over $300k. I thought I'd take a look . . . .
First, bear in mind that the median sales price has gone largely unchanged between 2006 and 2009, showing only a 3.5% decrease. (full market report) This would suggest (in some ways) that we've probably seen a roughly equivalent number of inexpensive and expensive homes selling over the past several years. This actually does not turn out to be true . . . . The first time buyer tax credit has likely increased the number offirst time buyers, and thus the number of inexpensive home sales. Most upper end home buyers have to sell an existing home before buying. A slower market has likely slowed down this trading up process, and thus decreasing the number of high end homes. Do you have other explanations for the shift in what types of buyers are actually buying in Harrisonburg and Rockingham County? Let me know what your guesses are. The fascinating part ot me is that despite a 35% increase in sales of inexpensive homes (sub $175k) and a 27% decrease in sales of expensive homes ($300k plus), we still only saw a 3% decrease in median sales price over the past three years!?! The median sales price increased 61% over the past nine years, at an average rate of 6.7% per year. Housing values in many other parts of the country have fallen significantly over the past three years, but the median sales price in Harrisonburg and Rockingham County has only declined by 3% over the past three years, at an average rate of 1% per year. Yet, despite the fact that home values are holding rather steady in our market, that doesn't necessarily mean that you'll be able to sell your home for the same amount that you could have sold it in 2006. What is the problem here, you might ask? It's your neighbor! You see, if you bought a townhome in Harrisonburg for $160,000 in 2006, you might think you could sell it for about $155,200 now (3% less) given the statistics above. But......if your neighbor bought their townhouse several years earlier for $130,000.....they may be competing with you by listing their house at only $140,000. They can, you see, sell for less and still make a profit. Likewise, if you bought a home in Rockingham County for $400,000 in 2006,you might think you could sell it for about $388,000 now (3% less)given the statistics above. But......if your neighbor bought theirhome several years earlier for $325,000.....they may be competingwith you by listing their house at only $350,000. They can, you see,sell for less and still make a profit. So....I'm not encouraging you to get upset with your neighbor, or try to get them to increase the asking price on their home --- but you do need to know that competing list prices affect the value of your home (if you're trying to sell it) just as much as recent sales (as reflected in median sales prices). Earlier this week I published my monthly market report on the Harrisonburg and Rockingham County real estate market. While my report does examine how single family homes performed compared to townhomes, it doesn't examine how City properties compared to County properties. Let's take a look at how each category performed in 2009, as compared to 2008. Interestingly, there was a much more significant drop off in the number of City properties (23% decline) as compared to County properties (6% decline). Yet, while fewer City properties sold, they seem to have (marginally) maintained their value better than those in the County. The median sales price of City properties declined by 3%, while those in the County declined by 5%. Above you will notice that townhomes outperformed single family homes in both measures I've calculated. There was a more significant drop off in single family homes (14%) as compared to townhomes (11%), and there was a more significant decline in single family home median sales prices (5%) than townhome median sales prices (3%). The conclusion here? City townhomes seem to be the general victor here, with County single family homes suffering the most. Interested in a different cut of the data? E-mail (scott@HarrisonburgHousingToday.com) or call me (540-578-0102) and I'll put it together for you! Home sales finished out at a respectable level in 2009, showing only a 13% decline from 2008 as compared to the 25% decline in sales pace seen between 2007 and 2008. The area's median price, however, slipped 5% -- the first decline in full year median values that we've seen in this troubled market. This past month's sales (67 in December) can't be used to predict too much in our market, because December sales were at roughly the same levels in 2007 and 2008 --- with significantly different months and years following those similar December values. That being said, five of twelve months in 2009 showed home sales at, above, or very close to the corresponding month in 2008. This may be an indication that the declining pace of home sales seen since 2005 may finally be slowing. The local year over year housing inventory has declined slightly, from 828 homes at the end of last December, to 792 homes for sale at the end of this December. That small decline, however, is still not enough of a decline to help the significant oversupply of homes for sale we have been experiencing for over a year. Read on, and dive into the details by reading the entire January 2010 Harrisonburg and Rockingham County Real Estate Market Report. Click the image below to download the PDF. ThoughI spend a considerable amount of time analyzing our local housingmarket, the majority of my time is spent helping people like you buyand sell real estate. If you (or someone you know) will be buying orselling real estate sometime in the near future, I'd be delighted tohave the opportunity to be of service. "The Rockingham County Planning Commission is scheduled to continue a hearing it began in November about a zoning ordinance amendment, which, if approved by the Board of Supervisors, will allow the rentals and, in theory, end the debate." It has been an interesting four years (wow --- four years) that this debate has been going on, and it made me stop to think about the state of the Massanutten Resort housing market. Below is a brief summary of changes in that market over the past four years, within the context of the Harrisonburg and Rockingham County housing market as a whole. As can be seen above, Massanutten has seen a steady decline in the number of home sales taking place in each of the past four years. That said, the Harrisonburg and Rockingham County market have seen a very similar decline. The only deviation here is that the Massanutten market continued to decline rather significantly (35% drop) between 2008 and 2009 while the rate of decline slowed down somewhat in the Harrisonburg and Rockingham County market as a whole (13% drop). The graph above shows changes in the median sales price of homes in the Massanutten Resort market as compared to changes in median sales price for the market as a whole. The difference is staggering! Harrisonburg and Rockingham County have seen a median sales price decline of 3.4% over the past four years. During the same time period, Massanutten Resort has suffered a 16% decline in median sales price. It's impossible to know how much of a correlation exists between the soft Massanutten Resort market and the short term rental issue, but I believe this issue has certainly played some role in the changes depicted above. One way to take a look at what is being built in and around Harrisonburg is by examining the Harrisonburg / Rockingham MLS to analyze listings circa 2009+. First, or note, a full 14% of listings currently for sale in Harrisonburg and Rockingham County appear to be new construction. (113 homes out of 793 homes). If you're considering buying a new home in Harrisonburg, feel free to call (540-578-0102) or e-mail (scott@HarrisonburgHousingToday.com) to consult with me. I work with quite a few builders and have become very familiar with the new construction process.